Angelika Herb was the Head of Mission for Papua New Guinea, and shares her experiences with us. During my first month in Papua New Guinea (PNG), I was exposed to the consequences of family and sexual violence. I went on my first field visit to Tari only three days after my arrival in April 2015. One of the first things I was told by our staff in the family support centre, was that survivors could not reach the centre during the night because of insecurity. And even if they managed to get to the centre our teams would have to send them back home after receiving medical care – often to their very abusers. This is because there is no safe house facility in Tari and the whole of Hela province. This experience and what I’d witnessed really stayed with me throughout my entire time in PNG. Time and time again our staff testimony showed me how sexual and family violence defined the life of so many women and children in PNG. And they are mostly suffering in silence. 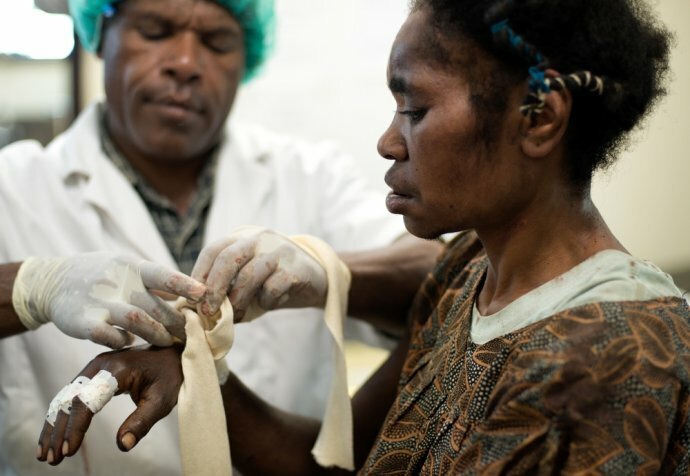 "Time and time again our staff testimony showed me how sexual and family violence defined the life of so many women and children in PNG"
I’ve been working with Médecins Sans Frontières for eight years now. During this time I’ve been in many countries and responded to different types of crisis in countries like Central African Republic, South Sudan and Haiti. Yet PNG was quite unique for me. Despite my experience, the levels of family and sexual violence stunned me. I had never been exposed to this kind of violence in a non-conflict area. Different from all my previous experiences, the violence we treated in Papua New Guinea happened in the places people should be the safest in their homes and communities. And a large amount of the individual serious cases were repeat abuse. Family and sexual violence is a multi-faceted problem and as such it requires a united effort from all different areas of the society to respond to it. As rightly put it by the Secretary for Health in the launch of Médecins Sans Frontières’ report ‘Return to Abuser’ earlier this March: a careful strategy involving many arms of the Government, directed to a common objective – to tackle family and sexual violence – is the only way forward. In this one year I’m glad to say that I have witnessed some progress in terms of response, as well as encountering many people in the government and in non-governmental organizations truly engaged into problem-solving. But much is lacking in terms of response-driven programmes. Despite approving key legislations, the implementation remains too slow. Since 2007 Médecins Sans Frontières has worked side-by-side with the National Department of Health (NDoH) in developing a model of care that would attend to all the needs of the survivors in one single session. Together we developed the Family Support Centre Guideline which was adopted by the NDoH on November 2013. We also worked on the Clinical Guidelines for FSCs which were finalized this year and currently pending approval by the Ministry of Health. Nevertheless, eight years has gone by since we started working with the NDoH and there are only seven Family Support Centres in the country. This is not enough. Survivors of family and sexual violence need access to medical care in all the provinces of the country. We urge the government to prioritize the roll out of these centres to ensure no women or children are left careless.